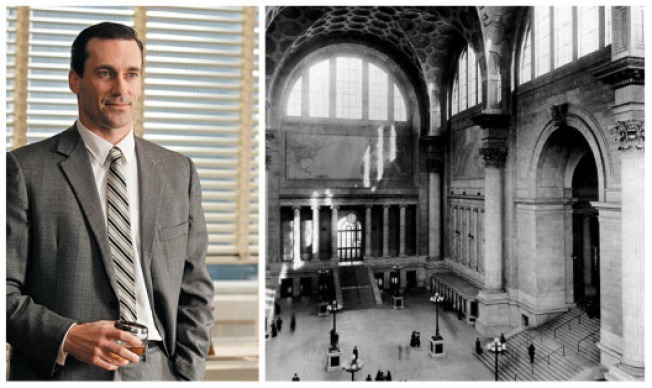 Architecture nerds got a minor thrill last night during 'Mad Men's' Penn Station peccadillo. We weren't the only ones whose ears perked up during a preservation discussion about tearing down Penn Station to build Madison Square Garden, which also name-checked one of NY's most beloved architecture critics, Ada Louise Huxtable. The LA Times' Christopher Hawthorne took note of it too: "As it turned out, though, the conversation struck thematic chords that resonated through the entire episode: cycles of aging, loss and then renewal...; memory as measured against progress; and even California versus New York, which in Mad Men is shorthand for freedom versus responsibility and novelty versus history." Don't get too excited. Hawthorne believes it also underscores how much has changed -- forget California, it's all about Dubai or Shanghai these days.